January 20, 2017 - Inauguration Day was a day to be remembered in American history. This was a day filled with hope for some and emotional turmoil for others. Following the eye-opening election season of 2016, the American people were left divided and confused as to what the real truth of the situation actually was. Whatever the opinion of an individual it seems to be a constant that no matter what the situation, those who are aware enough to ask questions and diligent enough to gain correct answers will be the ones who prosper. The presidency of Donald Trump has become a sign of impending victory for many of those who desire an end to totalitarian globalism. In contrast, Trump has become a source of worry and doom for some who still dependent on the rhetoric of a corporate media that has remained under the control of the outgoing regime. Though many of the protests for apparently positive change have been orchestrated by the very elitists these movements claim to oppose, these movements have cured many Americans of their physical apathy. However, there is still the issue of mental apathy among many crowds, which must be remedied before true and lasting change can take place. There is one important point to note about the so called Women's March on Washington: Authentic grassroots movements do not have official brand names right out of the gate. Nor do they spring up so quickly without having a true focus. It's the corporately sponsored movements that only pretend to want change that typically have these characteristics. These groups are by definition, astroturf and controlled opposition which only work toward the benefit of the globalist gang known as the Cabal. The Women's March seemed to be a continuation of the anti-Trump campaign which began during election season of 2016. This included a corporate media that pre-selected Clinton as the winner of the election with extreme bias. This bias came with the portrayal of Trump as being incapable of doing any good at all. (In reality, everyone has both flaws and positive characteristic, but the corporate media ignores this fact.) With this overt bias, the election seemed less like a presidential race, and more like an after-school cartoon series. This trend of bias continues even to this day, long after the election has ended. One particularly strange aspect of the present negativistic media rhetoric was that President Trump was supposedly the cause of corruption and globalism before he ever took office. This accusation has also come from those who emotionally depend upon the security that the globalists have used to pacify the people. This pacification has been a major component of the common technique of the divide-and-conquer method. Despite these accusations and bias against the president, Trump (though clearly flawed) seems to have made his share of positive contributions. To the surprise of some and the relief of others, President Trump has killed the Trans-Pacific Partnership—a destructive foreign trade deal that undermined the rights of all working Americans and millions of citizens in the affected countries. Here is Sputnik News with the story. The United States will withdraw from the Trans-Pacific Partnership free trade deal and renegotiate the North American Free Trade agreement, according to a new US trade plan released by the White House on Friday. The document suggested that the TPP had a negative impact on the livelihoods of working people and the US economy. "For too long, Americans have been forced to accept trade deals that put the interests of insiders and the Washington elite over the hard-working men and women of this country. As a result, blue-collar towns and cities have watched their factories close and good-paying jobs move overseas, while Americans face a mounting trade deficit and a devastated manufacturing base." This strategy starts by withdrawing from the Trans-Pacific Partnership and making certain that any new trade deals are in the interests of American workers," the release stated. "President Trump is committed to renegotiating NAFTA. Trump's strategy entails first withdrawing from the partnership, renegotiating its terms, and withdrawing completely if partners refuse the renegotiation. It also said that the new administration will ensure that "any new trade deals are in the interests of American workers. Many presidents make big promises prior to being elected, yet so many of them fail to follow through once they enter office. We may remember the past few decades. Consider how many broken promises we have seen and how many times the trust of the American people has been betrayed. During those times, instead of seeing pre-election promises fulfilled we saw our presidents bow to the will of the corporate world, to lobbyists, and to the agenda of the NWO. These instances have been a disappointment in each and every case, though we the people are typically distracted from the fact by effective propaganda. However, on this count it seems that genuinely positive changes have been made. Let's consider what we know about the typical election season. For decades now, we have come to realize that election season is little more than a play; a show; a fictitious display of questionable proposals and promises. This is all combined with enough mudslinging to draw in even those who only appreciate drama. Though many Americans seem to forget the false nature of these displays, the fiction has always been largely consistent. In modern times, election season has become very similar to a daytime talk-show. We have all witnessed this descent into excessive negativity during the 2016 election. The rhetoric from the corporate media seemed to have no end to the praise of Clinton and the defamation of Trump. However, this overt bias seemed to have backfired according to final election results. For those who have not yet looked into the TPP at this point, you have missed quite a bit. This trade deal was basically an international partnership between the elitists within the United States and those of numerous other countries. This was quite possibly the largest trade deal in history, and all but completely undermined the citizens of every one of the countries involved. Here is Truth Dig with the details. If you haven’t heard much about the TPP, that’s part of the problem right there. It would be the largest trade deal in history — involving countries stretching from Chile to Japan, representing 792 million people and accounting for 40 percent of the world economy – yet it’s been devised in secret. It’s no longer free trade versus protectionism. Big corporations and Wall Street want some of both. They want more international protection when it comes to their intellectual property and other assets. So they’ve been seeking trade rules that secure and extend their patents, trademarks, and copyrights abroad, and protect their global franchise agreements, securities, and loans. But they want less protection of consumers, workers, small investors, and the environment, because these interfere with their profits. So they’ve been seeking trade rules that allow them to override these protections. Not surprisingly for a deal that’s been drafted mostly by corporate and Wall Street lobbyists, the TPP provides exactly this mix. What’s been leaked about it so far reveals, for example, that the pharmaceutical industry gets stronger patent protections, delaying cheaper generic versions of drugs. That will be a good deal for Big Pharma but not necessarily for the inhabitants of developing nations who won’t get certain life-saving drugs at a cost they can afford. The TPP also gives global corporations an international tribunal of private attorneys, outside any nation’s legal system, who can order compensation for any “unjust expropriation” of foreign assets. Even better for global companies, the tribunal can order compensation for any lost profits found to result from a nation’s regulations. Philip Morris is using a similar provision against Uruguay (the provision appears in a bilateral trade treaty between Uruguay and Switzerland), claiming that Uruguay’s strong anti-smoking regulations unfairly diminish the company’s profits. The administration says the trade deal will boost U.S. exports in the fast-growing Pacific basin where the United States faces growing economic competition from China. The TPP is part of Obama’s strategy to contain China’s economic and strategic prowess. Fine. But the deal will also allow American corporations to outsource even more jobs abroad. In other words, the TPP is a Trojan horse in a global race to the bottom, giving big corporations and Wall Street banks a way to eliminate any and all laws and regulations that get in the way of their profits. Trade deals such as the TPP were either promoted with the flowery rhetoric of freedom and prosperity for the American people, or were hidden from the citizens of America altogether. This underhandedness typically gives the illusion that the government has the best interests of the people in mind. In the case of the TPP, they spoke extensively of benevolence, yet all the while they only held selfish intent and elitist prosperity in mind. While all of this was taking place, the corporate media was singing the praises of the establishment, reiterating how wonderful the new trade deals would be. However, the TPP was hardly the subject of focus at he time. During the time the destructive TPP deal was secretly being passed, the media was saturated with talk of the legalization of gay marriage, which in one way could be perceived as a positive step in a country that values human rights. However, this apparent benevolence was only a diversion from the all but complete betrayal of human rights on an international scale. It was clear at the time the TPP was passed that it was unethical. Considering the fact that the Congress members who signed it were not even allowed to read it entirely—and that the American people were not allowed to see it at all—revealed that there was most definitely something wrong with the establishment. 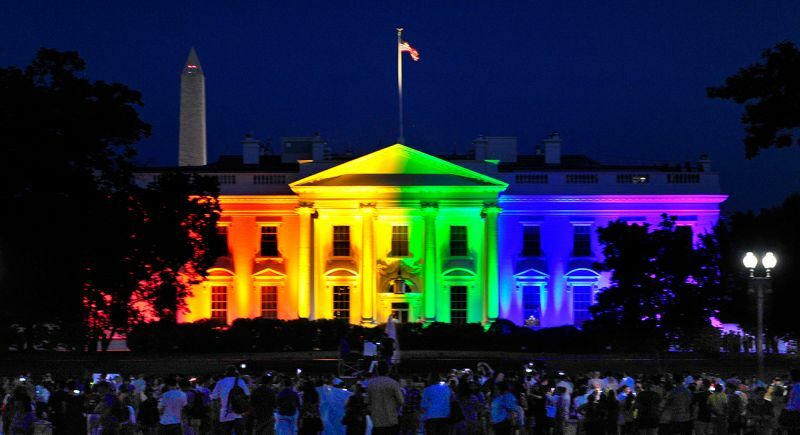 However, since the White House was decked out in rainbow colors, many people took little notice. We live in a world that requires us to think far beyond that which we see and that which we tangibly experience. This is a world that has been shaped and manipulated by untold amounts of propaganda and psychological mind games designed to distract us from uniting and overthrowing our controllers. However, many of us feel the oncoming change that will undo this control once and for all. A thought came to me as I was considering the latest questionable actions of President Trump. This was the commission and the continuation of the infamous Dakota Access Pipeline project. This decision seemed to be one of the most irresponsible a president could make. This choice by Trump follows in the footsteps of the tyrannical government he has claimed to want to overthrow. It is a given that the choice seems to be the most reckless and oppressive thing an authority figure can do, but is there more to the situation? What if there is something that we have missed? Let's consider the overwhelming task that Donald Trump has to accomplish. According to multiple sources of intelligence, Trump is the front man for the positive Earth Alliance. He has before him the task of overthrowing a Cabal of elitist criminals that has largely taken control of the entire world. This Cabal has had little if any opposition over the past century, and those that have risen up have been threatened, bribed, or killed to keep them silent. Now we see Trump stepping up to them with the intent to follow through. Now, why do you suppose he would take a page from their book and commission an anti-humanitarian project that would directly threaten America's fresh water supply? Personally, I think the move is a strategic diversion. Why else would a man who is so thoroughly hated by media do something so reckless knowing that he would be hated even more? In the past, Trump has proved to be so sensitive toward criticism from media, and now he commits an act that is sure to draw an even greater onslaught of media attention—giving the corporate media more gasoline to throw on the fire of dissension against their president. There has to be deeper reason behind this move. Imagine for a moment a move that would be so devastating, so thoroughly damning to the Cabal, and so unignorable by even the most corrupt of cooperate media that no one at all would be able to ignore it. Imagine trying to complete these final acts against the Cabal without being noticed and telegraphed with regard to your next moves. How would you do it? You would give the media a nugget—a piece of the exact same dirt they are looking for in order to continue the corporately sponsored presidential roast. This is why I believe President Trump will not follow through with the DAPL when it comes down to it. Let's consider free will for a moment. Right now, everyone who has violated the free will of humanity is being systematically taken out, whether by arrests or by extra-judicial killings. According to reports, no one can escape the onslaught of justice sweeping the planet. This would mean that if anyone in a positive position would need to be above reproach in order to maintain their positive influence and oftentimes even their safety. The Earth Alliance reported to be guiding Trump to make the decisions he is making follow the Law of Free Will closely. According to this universal norm, a person cannot act upon another being without eventually having the exact same experience. In other words, if we show cruelty to others, the same cruelty will be shown to us according to the severity of our situation. The law also entails holding the highest respect for the rights of others. This law is the staple for all people in the know with regard to world affairs, both on and off of the planet. It is very dangerous to violate the Law of Free Will in the present state of affairs. If Trump were to commit this violation, he may be severely injured and possibly even killed. If this is true he knows this, the Alliance knows this, and this would mean that he does not at all intent to allow the DAPL to go through, as this project would endanger millions of people and oppress innocent Natives. So as we consider the actions of President Trump, it is important to stay attentive and to hold him accountable just in case he goes off the beaten path. It is also important to refrain from the typical snap judgment, malice and hate that the corporate media and the average person have no problem throwing at him. The website, Truth Dig, gives a thorough view into the ills of the TPP and how the American government sold the people up the river for the sake of elitist agendas (per the regular trend for the past two decades). In this early act of defiance of the globalist elite, President Trump seems to have shown his true colors. This reveals that even though Trump comes from wealth and influence and has his shares of lumps, he has a large capacity to do what he says he will. Time will tell whether or not he is consistent, but it seems unmistakable that with regard to the TPP he has the capacity for notable integrity, despite the corporate media's endless attempt to attack and defame him at every turn. Here is one more article commenting on the new proposal from President Trump and the White House from the website, TruthKings.com. 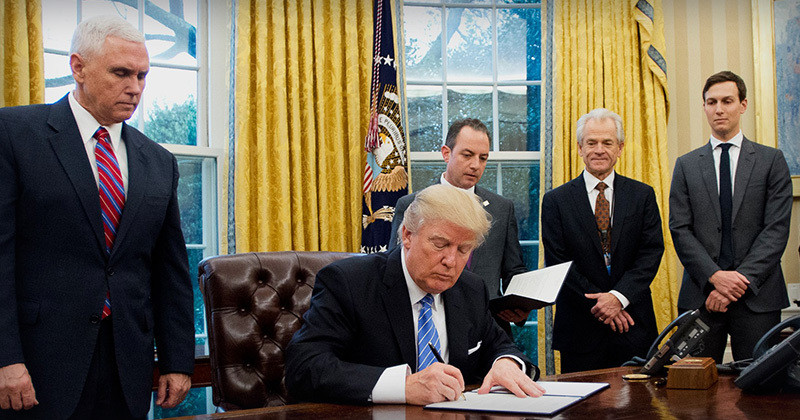 WhiteHouse.gov has announced, via President Trump, that the TPP deal will no longer have the United States as a participant. 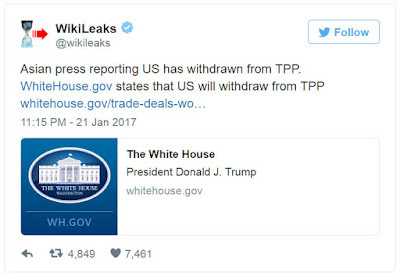 The TPP was one of Obama’s achievements, in terms of trade deals, and Trump has quickly lived up to his promise to remove the United States from the deal. This is sure to upset the herd. To reiterate, the TPP was one of many pieces of legislation passed during the past decade and a half which represented blatant opposition to human rights. The slight-of-hand tactics used to pass such bills have been systematically employed by past administrations. These past groups have done untold harm to the people of multiple nations and have served to further the globalist agenda of the banking Cabal. We have watched as our basic rights have been denied on multiple levels. From the White House to the jailhouse, we have seen the establishment converted into a massive parasite whose only purpose is to serve the global elite. Under healthy circumstances, the people of a nation would stand up and demand that these injustices stop. However, the American people have been so thoroughly propagandized that we have hardly taken notice. The corporate media of the West has been used as the tool to lull the people to sleep. It has given us a false sense of security and told us that "everything is alright" when it clearly has not been for years. The election of Donald Trump caused a media storm of untold proportions. Both before and even more so afterward, the corporate media has deliberately spun and misrepresented every story they could to infuriate the people. Instead of communicating the facts, this cooperate media machine gathered every societal problem that existed prior to Trump's election and heaped every last problem onto Trump's shoulders, implying that he was the Cabal, and the center of the Globalist agenda. This is not to say that the President is perfect by any means. It is to say that responsibility is crucial to solving the systemic issues we face as a country and as a planet. However, if we can do no better than to use flawed people as scapegoats and direct immeasurable hate and malice toward them, we ourselves add to the problems we blame them for. The truth is that the last people to get off of the couch and march into the streets were not those who noticed on their own, the problems they claim to care about. It was not their decision to get up and protest. That free-will choice rested on those who were first to march. I say this because the need for positive activism has existed for decades. Yet most of the people participating in the most recent marches never bothered to do so until now. Those who presently protest against Trump without truly knowing why, are not likely doing so because they themselves chose to. I'm sorry to say, but these people are doing so because that's what the all-mighty television wants. This is not to be insulting at all. We all must go through our times of awakening and break free from the clutches of media propaganda. I am also not implying that we will find a wonderful and flawless president when we do wake up. It is to say that when we become aware, our situation won't seem as woeful as the corporate propaganda claims it is. We have all the power we need to create the world we desire. When we realize that it is our former slave masters who are attempting to maintain division, we may then rise above their lies and unify once and for all. This unity is what they fear most, as it represents their ultimate end. It is understandable that those who still hold the emotional need to have a higher authority watching over them, are disheartened by the election of Donald Trump. It seems clear that he has a few character flaws that need improvement (just as the rest of us do). However, for those who need a president to go beyond the duty of presidency and to make the people feel warm and safe, Trump is an uncomfortable personality to have in the White House. For decades we have been given our political lullaby and our bottle of warm milk to make us feel safe and secure even when our lives were deliberately being sabotaged by elitist psychopaths. When our rights were being stepped on left and right and our minds were toyed with, we sat back and let it happen because we were made to feel secure by same hands that were violating us. Now that the lullaby has ended, many people are distraught because suddenly they are left to fend for themselves and don't know how to replace their former false sense of security. Again, we all go through this, but there is always a way to progress. The truth is that true security and real safety can only be forged in times of chaos and in environments that are largely unsafe and unsecured. Where true safety is created, there is no place for wasted efforts on illusion. If there were, how would we realize the need to create safety to begin with? The fact is that no matter what we think of him, the election of Donald Trump is largely a positive event. This is because it stripped us of our false sense of security and got us off of the couch. When the smoke clears, when the Soros-funded protesters go home, Donald Trump will still be president. At that point, the American people may then learn how to put their anger to good use as opposed to letting it be manipulated to the advantage of Globalists. At that point, we will remember what it is to be aware of the world around us, and we will work together to solve the issues that have plagued our world for the past century. Thanks Shem, nice article. I am also at a lost as to DAPL. It didn't make any sense to me but the distraction angle kind of fits. I expect things will still be messy for awhile but I also expect compromises. Hey, we're americans, we have two sides to everything....and now I am thinking people will begin to understand that working together is about putting our egos and inflexible opinions aside and that compromise is not a dirty word. I hope.